Combining both wood and a high quality black porcelain socket, there is no place that our Single Pendant cannot be used. The wood stack you see in the picture has been made to mount directly to your ceiling electrical box. Each wood stack is the same size, all are finished with our Jacobean stain and have their own unique patina. 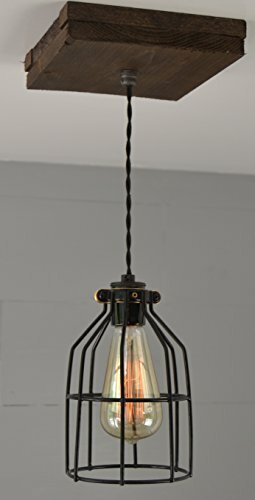 This light is designed for an easy install and the 4' of pendant cord each light comes with allows you to hang them as high or low as you want. Their are clips in the wood stack that allows you to adjust them before you hang the light This light is already wired by us for you and all you have to do is he fun part of adjusting the cords to your needs. Cord Length: Comes with 4 feet of twisted black cord that can be adjusted to your desired length in your own home! Bulbs: Accepts all standard bulbs up to 60Watts - Bulbs are not included. MADE IN THE USA | Each unique, style light is carefully crafted in Conshohocken, Pennsylvania. With some made from authentic reclaimed wood materials. If you have any questions about this product by West Ninth Vintage, contact us by completing and submitting the form below. If you are looking for a specif part number, please include it with your message.